What are you going to do with all of those grass clippings? If you just mowed your lawn and don’t know the answer, then you are really missing out. While grass clippings may be a nuisance to regular homeowners, you can put them to great use on your homestead. 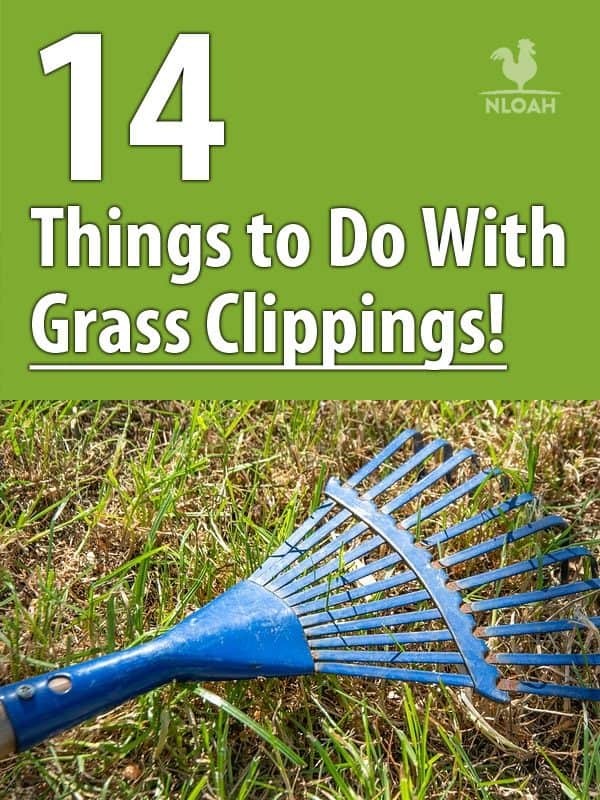 In fact, you may find grass clippings so useful, you will be asking other people to bring theirs over to your house. So forget about bagging them up and putting them on the curb for trash pickup. 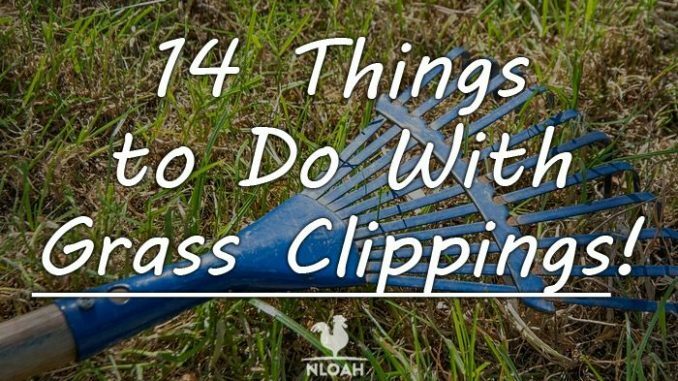 Let’s look at 14 things to do with grass clippings on your homestead. Do you have a compost pile on your homestead? If not, you should start one right away, and put those grass clippings t good use in it. Fresh, green grass clippings are loaded with nitrogen and moisture; they are great to add to your bin, and to mix with manure and high carbon items, such as dead leaves. You can also set the grass clippings aside for a bit, let them dry out, and then add them to your bin. In any case, grass clippings are rich in nutrients that are useful for compost; additionally, the sheer quantity of grass clippings you likely produce will help to add bulk and volume to your compost pile, so you’ll have plenty of compost after the pile matures a bit. If you’re buying bags of mulch at your local big box store for your homestead, you’re definitely doing it wrong! Instead, you should definitely consider using many of the organic materials your homestead already produces, like grass clippings, to mulch your flower beds and rows of vegetable plantings. Grass clippings can help to lock in moisture to your garden beds, and will slowly add nutrients to the soil as they decompose. And remember: grass clippings are 100 percent free, too! If you use fresh grass clippings, ensure you do not layer the mulch on too thick; it has a tendency to retain a great deal of water, and can lead to mold or mildew sprouting up in your garden. A ¼ inch layer is just right with fresh clippings. Dried grass clippings are an even better choice as a garden mulch. When they are dried out, the clippings can be layered on thicker. While clippings are not as attractive as traditional mulches, they work fine, and they are free! Are your flowerpots and containers always end up drying out on the hot days of summer? Maybe your grass clippings can help. A thin layer of fresh glass clippings atop the soil can help your containers retain water, and also add nutrients to the soil as they break down as well. Simply spread a quarter to half-inch layer of green grass clippings on your soil, and let them get to work protecting the soil. Remember not to layer the clippings too thick, however, since they could end up retaining too much water, which could lead to rot in the plants’ stems and roots. Organic liquid feeds are very popular these days; much like compost, they can provide nutrients and organic materials that can feed your plants and improve your soil. Plants can absorb the nutrients these feeds deliver quicker than other forms of organic fertilizers. Sometimes these mixtures are actually referred to as “compost tea.” Fortunately, you can use grass clippings to make you very own organic feeds. Take a five gallon bucket and fill it with untreated water. Add four to five handfuls of fresh grass clippings, and set the bucket in a partially shaded area; cover it with some used screen or other mesh material to keep the mosquitos out of it, and then let the mixture sit for two weeks or so. It will become a foul smelling mess, but that’s ok. After two weeks, add a cup or two of this organic feed to your watering can, and use it to water your plants. They will definitely appreciate it! There is another great option for grass clippings: feed it to your livestock. Cattle and sheep often love grass clippings. Organic, untreated grass is also good for them, too; it is high in protein, and has a high level of digestible content as well. This is a great supplement to the standard feeds and silage that you already provide to your cows, goats or sheep. If you raise geese and other poultry, they’ll love it, too. However, if you do decide to feed grass clippings to your animals, ensure that it has not been sprayed with pesticides or any other chemicals. Always use caution before accepting other peoples’ grass clippings for animal feeds, too. Yes, your livestock will appreciate an occasional meal of grass clippings. But don’t forget about your worms! If you have a worm bin (and if you’re a homesteader, you definitely should make or buy one), grass clippings can be extremely useful. Simply mix in some of your grass clippings with shredded paper or kitchen waste, and let your worms go to work. Common earthworms eat their weight in wastes like this every day. In a short period of time, your worms will multiply, and your grass clippings will be turned into one of the most sought after materials for gardens: worm castings. Worm castings are extremely beneficial to soil, and can dramatically improve plant health. So put some fresh grass clippings into your bin, and let the worms get to work. Raised bed gardening is more popular than ever, and there are many different techniques, from simple elevated walled beds to hugelkultur methods. Raised beds are great options for homesteaders who have poor and/or rocky soil, and grass clippings can enhance all of the raised beds you make. Many gardeners who build raised beds layer different types of organic materials into them, which helps improve the overall health and fertility of the soil; this is sometimes called the “lasagna method.” If you choose to do this, grass clippings can be really helpful; simply mix your fresh grass clippings with dry, carbon-rich material, such as dead leaf litter, and use it to make the base of your raised beds. Cover this mixture with organic compost and garden soil, and you’ll be ready to grow terrific vegetables in no time. Are you raising fish or other aquatic creatures on your homestead? Aquaculture is an increasingly popular activity for many homesteaders. People are raising fish like tilapia, catfish, trout and crayfish at home these days, both for personal use as well as a way to diversify what their homestead sells to customers. If you decide to raise fish, it is always a good idea to have a supply of freshwater algae, or green water, on hand. Green water is an important food for many fish fry; it is also a food that invertebrates that make up a big part of fishes’ diets need to eat, too. And lucky for you, you can use your grass clippings to help you culture an unending supply green water for all of your aquaculture needs. You can make your own green water fast filling a 55 gallon food-safe barrel with untreated water. Ideally, if you can obtain some green water of your own, either from a fellow homesteader or online, it will help speed up how fast you can produce a green water culture of your own. Fill a large mesh bag with fresh glass clippings, and then place it in the barrel. Keep the barrel in a sunny location, cover it with a screen so mosquitos cannot lay eggs in it, and gently aerate it with a standard aquarium air pump. You should get green water in about a week or so. Every few weeks replenish the fresh water, and change out the old grass clippings for new ones, and you will have a permanent supply of this valuable aquaculture resource. Do you have a perpetually overgrown part of your yard or garden that you want to put to good use eventually? Maybe your grass clippings can help by becoming a weed barrier. Cut back the weeded area in question as low to the ground as possible. Then, pile a layer of fresh grass clippings om the area that is two to four inches thick, and wet it down. These clippings will form a mat that will help prevent the weeds from growing back. Each time you mow your lawn, add a new layer of grass on the barrier to deter stubborn weeds. When you are ready to use the area (to plant a lawn, vegetables, etc. ), simply rake up the matted weed barrier, work the soil, and it will be ready for you to reclaim it. Waste paper is similar to grass clippings; you end up with a lot of it lying around. What do you do with all of the extra paper that accumulates in your home? You either toss it all in the trash, burn it, or add it to your compost pile. One way you can put both waste paper as well as grass clippings to work is to make new, artisanal paper from it all. It is not hard to make paper from old papers you would otherwise discard. And adding materials like grass clippings to it can give your artisanal paper a unique texture that you won’t be able to find anywhere else. Homemade paper is great for crafts, and you may be able to sell it at a farmers market or online. And other than the time you put in to make it, you can produce your paper out of materials that usually end up in landfills. o make green dye, take a quart of fresh grass clippings, and soak them in a stainless steel or ceramic pot of water overnight. After the grass has thoroughly soaked, boil it for thirty minutes, let it cool, and then strain the liquid through a cheesecloth into another container. Then you’ll have a fresh supply of homemade green dye to use on all of your favorite craft projects. Heating your home can be expensive, especially if you’re a homesteader on a tight budget. If you are adventurous, and are willing to experiment a bit, maybe you can put your grass clippings to work heating your home this winter. People have been compacting dried grass clippings into various burning fuels, like logs and pellets. They then use these homebrewed fuels in their wood and pellet stoves. This takes some work and technical know-how; and before you decide to do this, you should also check and ensure that local regulations permit you to manufacture your own fuels, and that your wood or pellet stove system can actually handle it. Still, if everything works out, you may be walking on a cheap, renewable source of energy every time you stroll across your yard! Remember, before you try anything like this on your own, ensure you consult with local authorities on regulations involving pellet stove fuels, and try to find someone with the skills and expertise to teach you how to make these grass-based fuels properly and safely. Another way you can use your grass clippings is really simple: just leave them right in your lawn! When you mow the grass, the grass clippings can be left in place to mulch the soil and make it healthier. Letting your grass clippings stay on your lawn can help return important nutrients to the soil, and feed organisms like earthworms, which are vital to the health of your lawn and garden. If you plan to leave your grass clippings in your lawn to mulch, remember not to let your lawn get too long; you don’t want to leave clumps of clippings all over the place that will end up stifling lawn growth. Even if you’ve read everything here and still don’t plan to use your grass clippings, don’t just bag them in the trash or haul them to the dump; someone will almost certainly want to use them. There are likely homesteaders, farmers, or gardeners who want to use your grass clippings as mulch, compost, animal feed, or something else. Rake them all into an easily accessible pile, place an ad on Craigslist, and watch how fast those grass clippings disappear. If you have a good recycling center nearby that produces composts and mulches for the community, that is another option as well. Grass clippings are not garbage; they are an organic medium that can be put to immediate good use on your homestead. Whether you use them to improve your soil, feed your animals, or heat your home, you should look at grass clippings as a beneficial resource that can make your homestead better. If you avoid treating your lawn with pesticides and other chemicals, you will have an enormous supply of green material which can be used in many different ways, too. So go mow your lawn, and put those grass clippings to good use as soon as possible! If you aim is to feed animals with clippings, lawn will soon need fertilising with minerals etc else eventually clippings will not be nutritious. If using grass clippings as animal feed, please, please, please make sure it hasn’t been bagged up. It will start to ferment in the bag, and that bacteria can kill. I, personally, lost a beloved horse when a neighbor “kindly” dumped bagged clippings into the pasture for the ponies.